SEOUL, Oct. 10 (Yonhap) -- South Korea is considering launching probes into global tech companies that have come under suspicion for not paying their dues, the government here said Wednesday. The move comes amid growing criticism that global tech giants, including Google Inc. and Facebook Inc., have not properly paid their taxes to local authorities while generating profits every year. 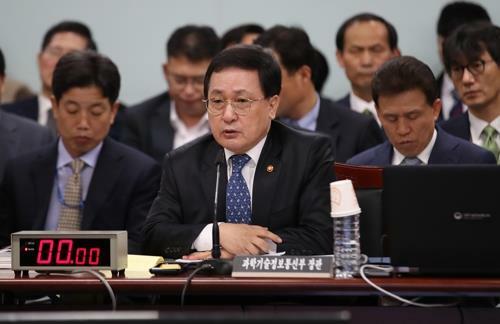 "The government is aware that it is a problem that needs to be more actively addressed," ICT Minister Yoo Young-min said during an annual audit with lawmakers. "The ministry is mulling over the launch of a joint investigation with the Ministry of Economy and Finance, the Financial Services Commission and the Fair Trade Commission." The lawmakers at the gathering argued that the government should come up with countermeasures to properly deal with alleged wrongdoings by the multinationals if they do not follow local regulations. "It is vital that an organization should be set up to come up with joint countermeasures against global companies that may not be paying their taxes here," said Rep. Kim Kyung-jin, adding that it's important to find out how much foreign companies make. Google is estimated to have recorded sales of nearly 4.9 trillion won (US$4.6 billion) in South Korea last year, according to said Lee Tae-hee, a professor of business administration at Kookmin University. The figures are based on an annual earnings report by Alphabet Inc., Google's holding company. The telecommunications providers have argued that Facebook should share the cost of maintaining the heavy data traffic generated by its social networking operations.